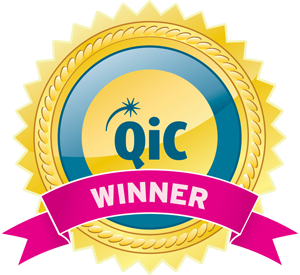 Unlike the warfarin monitoring ‘yellow book’, there is no standard patient alert tool for novel oral anticoagulants (NOACs). So this standardised card was developed for use across primary and secondary care within the north of England’s strategic clinical network. Doctors, pharmacists and specialists participated in its developed process, as did local patient groups. The card was designed to be easily recognisable, with a similar colour to the bright yellow warfarin monitoring books, and able to be fitted in a purse or wallet. Launched in April 2015 across the network with supporting educational material, the card aims to increase patient knowledge about their treatment and inform and educate health professionals to improve patient safety. Up to 2.4% of UK patients per year are prescribed anticoagulant medication to prevent strokes in atrial fibrillation and to treat venous thromboembolism – and these numbers will rise as the population ages. The management of warfarin is well understood but there are many reports of ‘near miss’ patient safety events involving NOACs and the existence of multiple, slightly different, physician and patient education tools can lead to more confusion than clarity. 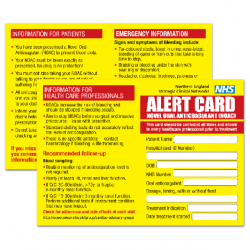 By developing a patient safety alert card for NOACs which includes patient and clinician education material, the team aimed to take advantage of the infrastructure of the strategic clinical network to allow an integrated and standardised approach across different NHS trusts, regional boundaries and primary and secondary care. The card will make a comprehensive and standardised set of information available to patients prescribed NOACs regarding their therapy, and to the staff who treat them.